Placing the right number of & modern social sharing buttons can increase your social media sharing by great extent. 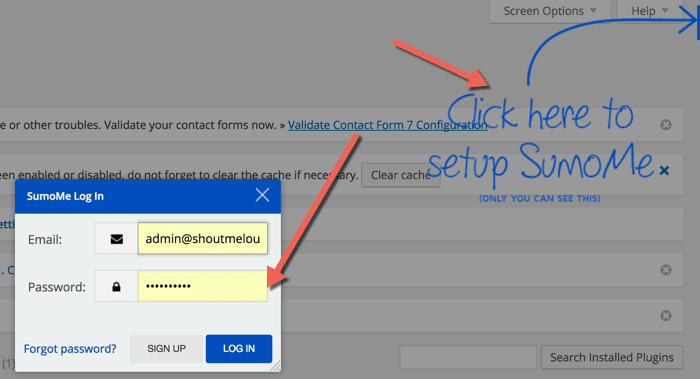 From past one week, I have been testing not so new free tool call SumoMe to add social media sharing button here at ShoutMeLoud. My experience with the SumoMe was pretty solid & finally after testing. I’m sharing the complete guide to getting social media sharing button on your blog. The good thing is, even if you are a BlogSpot blogger or using any other platform than WordPress, you can still add these modern looking social media sharing button on your blog. I will share the stats, features & other stuff by the end. First, let’s quickly follow the steps mentioned & Let’s add social media sharing button on your blog. Head over to Sumome SML landing page & add your blog URL to get started. On the next page, enter your name & email to complete the registration. 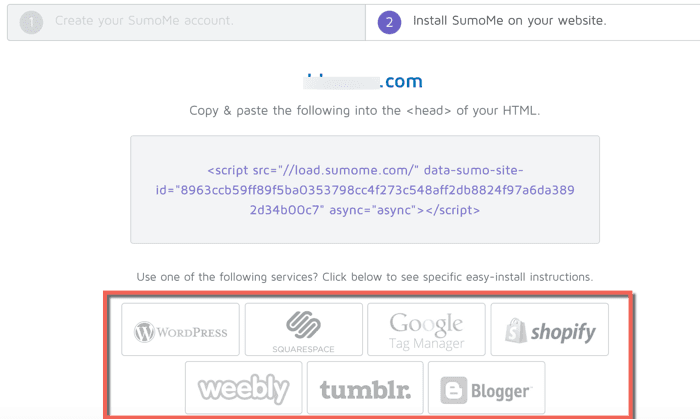 On the next page, you need to add Sumo me tag on your blog. The good part here is, you need to do it once & after that you can configure everything using SumoMe without touching your codes. 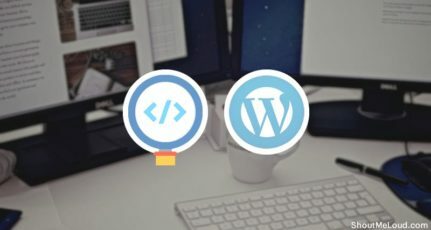 If you are using BlogSpot or WordPress, you can use Google Tag Manager to add code. In my case it’s WordPress, so I clicked on WordPress & installed/Activated the SumoMe plugin. Select the site from the list & click on Activate now. This will bring a screen like this, where you need to click on Sumo Store. Sumo store is the place where you will find various apps like Email marketing apps, Analytics apps, contact form & many other that you can integrate on your blog. Most of them are free & you can get pro features by upgrading it. If you have never used SumoMe before, I suggest you to use their free features for a week to see the effectiveness. This is what I did before reviewing it here with you. 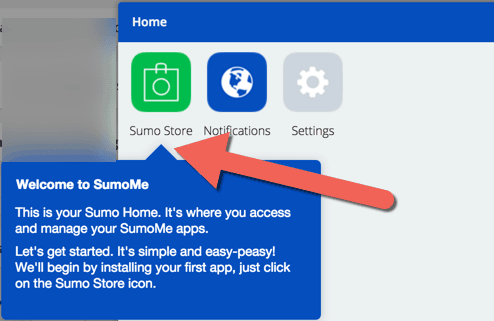 In the above screenshot, you can see how Sumo store looks like. 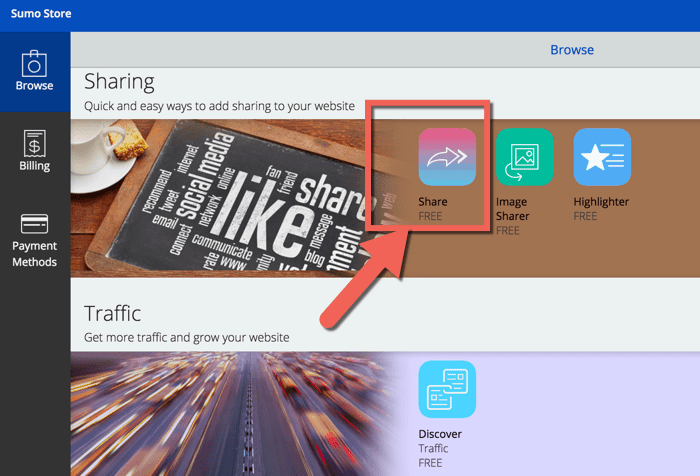 On this page, scroll down to the sharing section & click on Share icon. On next page click on Free > Open to install & start configuring social media sharing feature of Sumome. They have three payment plan & depending upon the size of your blog & your requirement; you should choose one. I would recommend you to start with the free plan & test their all apps. Depending upon your experience, you should pick the right plan for yourself. 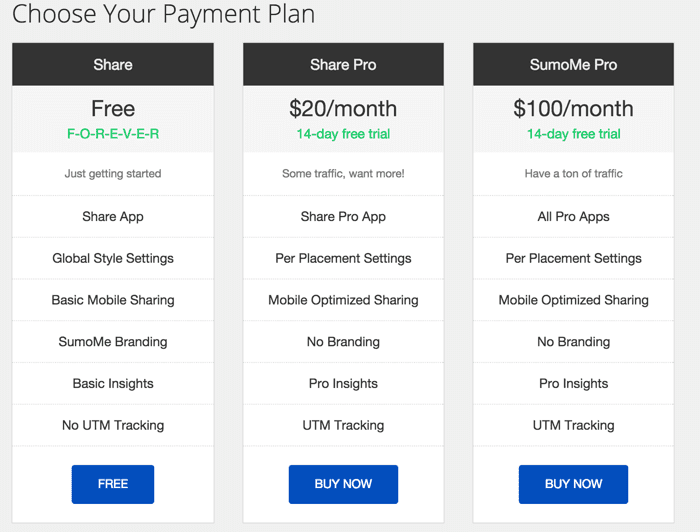 I would recommend you to buy SumoMePro in the longer run as it offers all pro feature. (You can anytime upgrade or downgrade plans). For now, let’s select the free option & move ahead. This is the section which you will find most interesting. Sumome let you select from wide variety of social media sharing buttons & you can drag & drop to offer popular buttons first. Once this is done, then click on Save at the bottom & then click on Layout. Layout option let you select & display sharing buttons at your desired location. This supports desktop & mobile both. In the above screenshot, I have placed social media button at all the prominent place. Another important option that you should configure is the services. Here you can add the Twitter URL, which will be added by default when a reader will tweet your article. 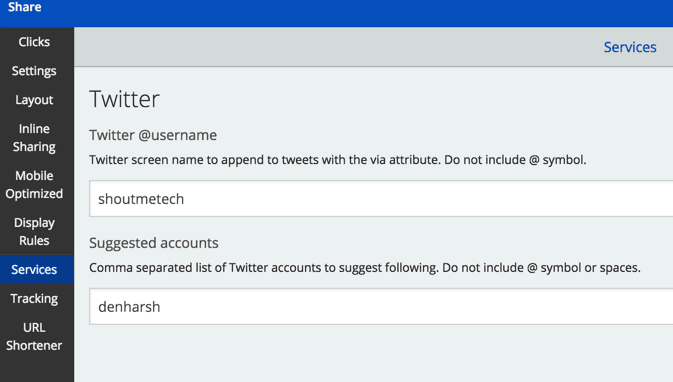 After that, you can configure to suggest a Twitter profile to follow. Another feature such as tracking, URL shortener is also there. If you are a pro member like me, you can configure the buttons for your mobile site. This is pretty useful, especially when we know that users take different action on mobile. Here is what I have for ShoutMeLoud (You can probably see it if you are reading it on mobile phone). There are many more features which I’m not covering. I let you explore some of the features of your own. Overall, my experience with Sumome is pretty good & I was wondering why I took so much time to try this. What appealed me about Sumome is the ease of adding latest apps which are proven to increase conversion. For example Apart from Social media sharing buttons, you can also add the various opt-in box around your blog. One of the features that I love the most is Heatmap feature of Sumome. It helped me discover the biggest flaw of ShoutMeLoud existing design & it let me work on the new homepage layout. More on it later & for now, I suggest you create your free account on SumoMe & get started. Since Sumome works with all kind of online website & blogging platform, you will have no problem integrating it. It takes away the biggest headache of adding modern social media sharing buttons & making changes on the fly. Initially, it might take 5-10 minute to get use to Sumome interface & after that, you will have gala time working with it. Do let me know your review & experience of Sumome. 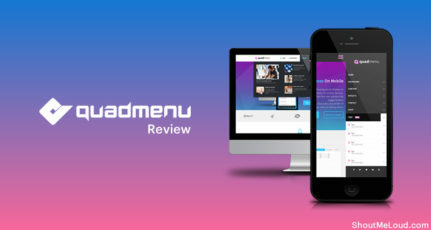 Share about this useful suite of apps with your friends via email or Facebook. I wanted a fresh look on my social media icons and SumoME looks like a great tool. You have shared different features of this tool. What a great post man. I will have a try on this tool and will revert back if I have some difficulties. Dear Harsh sir, you should include Getsitecontrol in your favourite list. Because it is better than sumo me. I m surprised with Getsitecontrol because it doesn’t make any request for sharing buttons, email capture box, follow buttons. So it doesn’t affect a bit of speed of my blog. Thanks Ravi for letting me know about this service. Will check out Getsitecontrol & if it seems good, will feature it on ShoutMeLoud. SumoMe has changed the look of my website posts and this is amazing. Thanks Harsh.!! :). You can do that using Tubebuddy but it would work for your channel only. I personally never tried SumoME before but after reading this article, I am thinking to give it a try. Also, it will be interesting to see how Whatsapp sharing button works. Thanks for this wonderful share button. I just applied it and it actually worked fine on myschooltrick[dot]com. I love the look. Thanks Harsh Bro. I’m searching this plugin for Long Time. Now I Got it !! Thanks for the Article. Thanks for sharing this useful article Harsh. In past I’d tried SumoMe but I didn’t get it and finally messed up. I would like to expect the best social share button which are lightweight and doesn’t generate much requests. I’m currently using the Jetpack social share with custom CSS. Awesome dear, I would love if you post about large social sharing buttons. 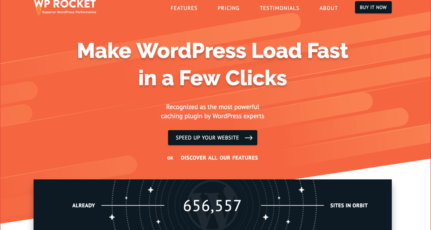 SumoMe is one of My Favourite For WordPress Blog from a Long time. 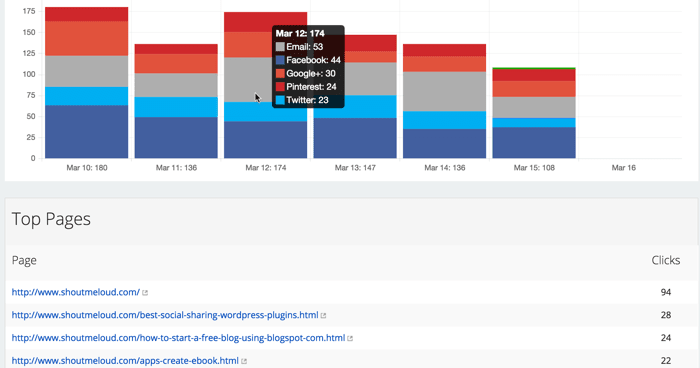 it Working Really well and have seen that getting good Sharing from the reader by using this Plugin. thank you for sharing this useful Guide. I have been using Sumome plugin for a while now. But, one thing I have noticed that Sumome Api load causes some problems in Google Insights Page Speed test. Rest everything is fine and its the best plugin I have used till now. Used SumoMe for a while but didn’t find it Okaish. It was Slow to load on my site. Whereas, I find Cresta good for sharing + few other plugins for landing pages and email builders! A single widget which can take care of all these. Thanks, harsh you are the best you solve my problem of sharing now on my blog I use SumoMe and its really nice and very effective thanks for solving my problem.